I am delighted by the news that the IA Institute is now the home of the IA Conference. 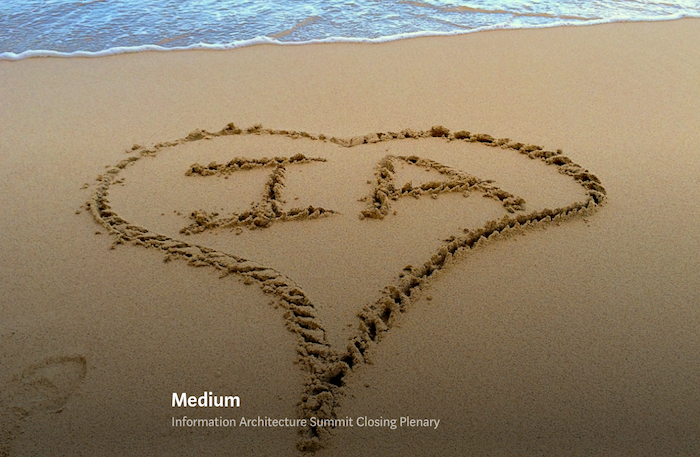 I attended every single IA Summit, and I spoke of my love of the community when I gave the 2014 Closing Plenary. But until recently, I was unsure if I’d continue to participate. I voiced my concerns in July, and ever since have been talking with the IA Foundation and the IA Institute about how to move forward with respect to governance and the code of conduct. We worked through painful issues. Both groups faced hard choices. There was debate and agonizing. But, in the end, people decided to do the right thing. First, our conference will now be under the permanent oversight of the IA community’s democratically elected institution. At last, the IAC and World IA Day will share the same home. Second, these folks have demonstrated the courage and commitment to not only have a Code of Conduct but to enforce it. Let me tell you, this is no small thing. So, I am happy to say I will be participating in the 2019 IA Conference. I may even bring our daughter. I hope you will join me in offering your support. Please make a plan to attend the IA Conference and join or donate to the IA Institute. This merger is a milestone in the history of information architecture. Now it’s time to shape the future.